Next Game set for November 7! First time players Tom Maneri and Dan Valenti gave cousin Bri a run for the money as the final three squared off. This was a big turning point hand. VJ was the money leader, and Brian went all in after checking. It was at least a $500 hand. Brian had 4,7 in the hole and only stayed for the flop because he had put in the big blind. On the flop he got the boat and played it well. 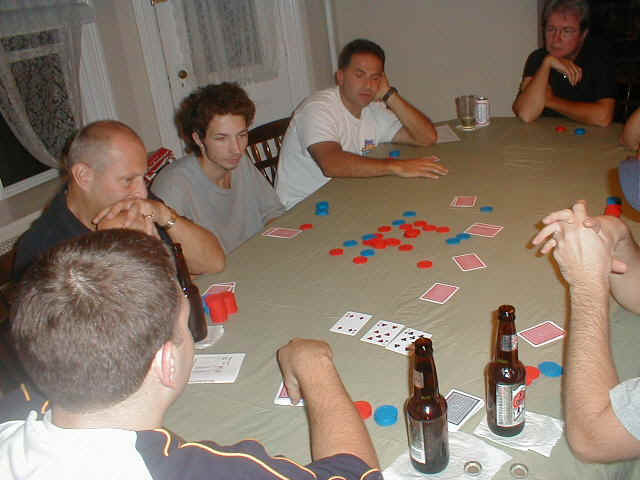 Although Brian was the leading money winner going into the third WSOP Rockaway satellite tournament, he was still unhappy with his play. He went into the first two tournaments with big leads when things got down to the final two players, and lost both of them. Playing head to head against a surprisingly good firs time player, Tom Maneri, Brian was able to hold on for the victory. Tommy had to be talked into playing, and he was glad he was. He was all in twice early, and won both to keep his game alive. 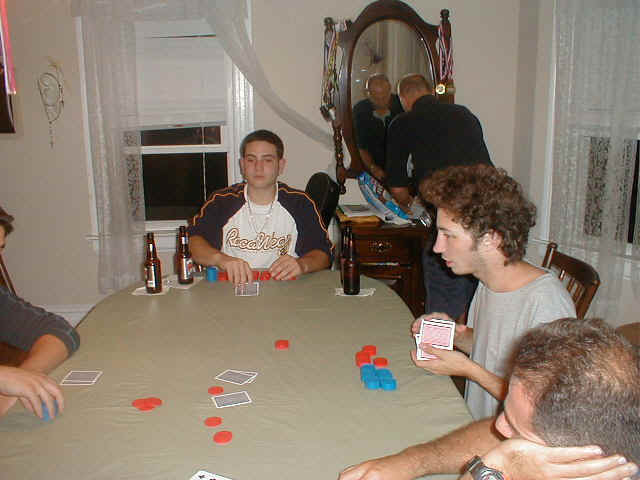 Other newcomers, "Baltimore" Dan Valenti traveled from hurricane torn Baltimore to teach his uncle John a few lessons. Johnny would get good cards but Dan always had better and would play them beautifully, suckering in his uncle. VJ was dominating early and had a comfortable lead for over an hour until a big show down hand described above with Brian. George made the necessary adjustments to take fourth and is confident he will continue to rise. Quentin Sica continued his consistant play, always near the middle to top of the pack.